Transformerless amplifiers for VIGIL3 voice alarm systems are powerful, compact and robust. These amplifiers form part of the VIGIL3 EN54 certified voice alarm system. 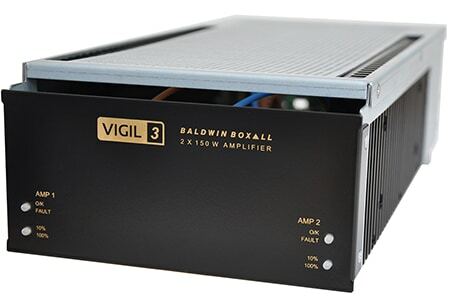 The VIGIL3 amplifiers form part of our new voice alarm range of products. They use new transformerless technology and have many great features. There are five modules in the range – dual 75 Watt, quad 75 Watt, dual 150 Watt, quad 150 Watt and dual 300 Watt. Each highly efficient amplifier has a built in power supply and floating transformerless output. Compared with VIGIL2 units, they are up to an incredible 66% lighter on a like-for-like basis. Amazingly, although amplifier power has increased and the power supply is incorporated, the units themselves are reduced in size. The smaller size means less rack space which, in turn, means the rack footprint is reduced. Also battery size on a Watt by Watt basis, will be reduced. These attributes all help with the cost of the installation of the system and saving on space – a valuable asset for many companies. These amplifiers, when combined with the VIGIL3 battery charger module and the BVRD2M/BVRD2M4 EVAS VIGIL2 voice alarm router(s), form a powerful EN54 compliant voice alarm system (VACIE). Our VIGIL3 range, as with all of our products, has been designed and built with quality and absolute reliability in mind. New floating transformerless technology which negates the need for cumbersome, heavy transformers. This means that each unit is considerably lighter than its equivalent – up to 56%. There is far less copper required during manufacture and there is increased space within the unit which enables increased airflow. VIGIL3 amplifiers provide increased power in a smaller sized unit when compared to alternatives. It is possible to fit up to 1800 Watts of power in one 2U rack space. Each unit includes a built-in power supply – thus freeing up valuable rack space. The amplifiers have a sleep mode which operates, not only when the system is running on batteries, but also when it is running on mains power.